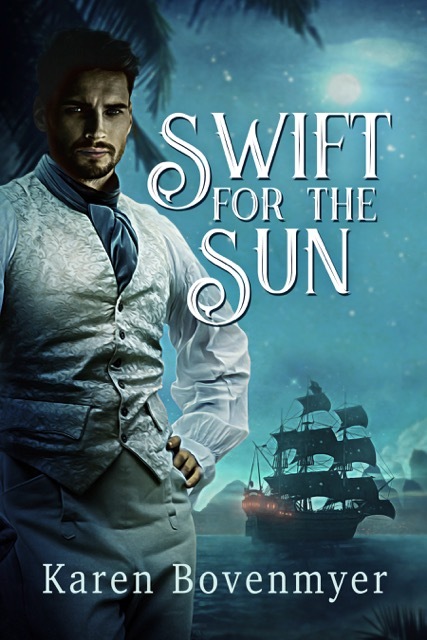 Karen Bovenmyer’s (Popular Fiction, S’13) thrilled to announce her first novel, an LGBT romantic pirate adventure set in 1822 Caribbean, Swift for the Sun, now has a cover (by the amazing Anna Sikorska) and a release date: March 27, 2017, from Dreamspinner Press. Karen’s also sold a 300-word prose poem featuring marooned interstellar spies called “Save Our Souls” to Silver Blade Magazine for their February issue and created an audio recording of the poem as a companion piece. She’s excited to announce that her zombies vs robots 1500-word story “We Are Still Feeling” earned a Finalist for 4th Quarter 2016 in L Ron Hubbard’s Writers of the Future contest. 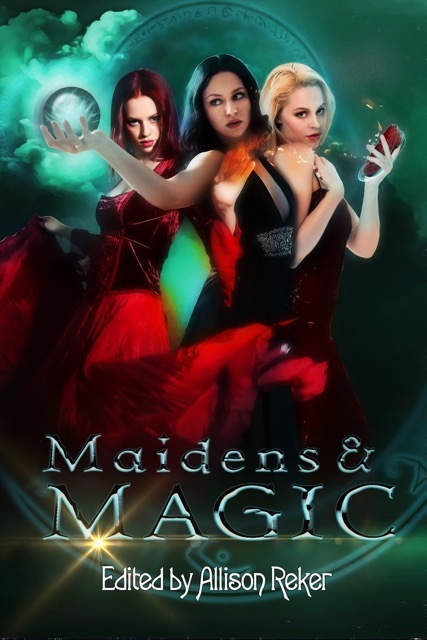 Her 15,000-word Dickensien fairytale novella, “The Beaded Slipper,” will appear in Crimson Edge Press’s Maidens and Magic anthology, February 14, 2017; she’s thrilled that her character Sasha is on the cover (the blonde woman holding the red slipper). Karen is also chuffed her unrequited astronaut love poem “The Blind Elephants of Io” (which you can hear read by British actress Patsy Prince) has been nominated for a Rhysling award by members of the Science Fiction Poetry Association. Two other flash stories “Samuel Alexander’s Storm Angel” (Roane Publishing’s Flash Fiction Fridays) and a reprint “Like a Soul” (Creepy Campfire Quarterly: Science Fiction Issue) will be published in February. STONECOAST REPRESENT! Two new stories by Julie C. Day (Popular Fiction, S’12) are out this month. 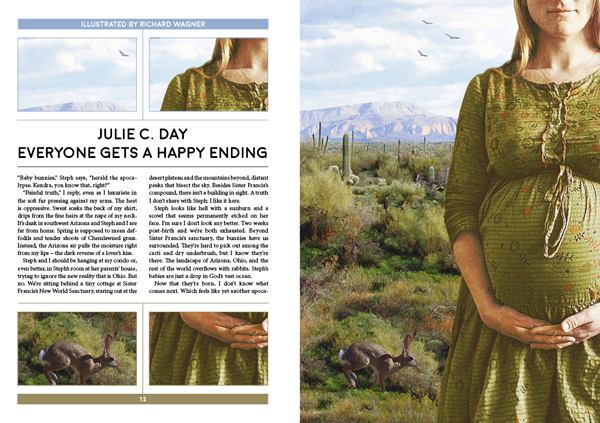 “Everyone Gets a Happy Ending” concerns itself with female friendships, national fertility, and the desert Southwest; it’s available in the January/February issue of Interzone. Julie’s second story, “One Thousand Paper Cranes,” melds ideas about the neurobiology of memory, restricted-environmental-stimulation therapy, and part selves; you can find it online in the Winter 2017 issue of Kaleidotrope. On the podcasting front, both episode 135 of Far-Fetched Fables and episode 433 of Podcastle are now available. The first podcast features Julie’s narration of Sharon Shinn’s “The Double-Edged Sword.” The second contains Julie’s reading of Sandra O’Dell’s fabulous and fabulously funny “Telling Stories.” You can also find Julie—live and in person!—on various panels at Boskone 54, February 17-19 at the Westin Waterfront Hotel in Boston, MA. Stop by and checkout her reading on Saturday, February 18th, at 1:30 p.m. in the Independence room. Alan King’s (Poetry, W’13) book Point Blank was named among the “Best New Poetry of the New Year 2017” by the Washington Independent Review of Books! Learn more here. 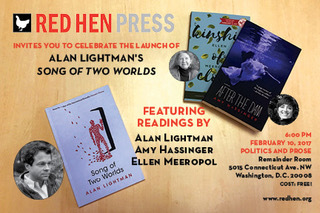 Ellen Meeropol (Fiction, W’06) will be on a panel at AWP titled “Second Blooming: Women Authors Debuting after Fifty” on Friday, February 10, 10:30 a.m. She will also be reading from her third novel, Kinship of Clover, at Politics and Prose Bookstore on Friday, February 10, at 6:00 p.m.
Bruce Pratt‘s (Fiction, S’04) short-story collection The Trash Detail has been selected for publication by New Rivers Press. His full-length play The King of France, which won the Meetinghouse Theatre Lab’s annual new play contest, received a staged reading on January 21 in Winter Harbor Main. 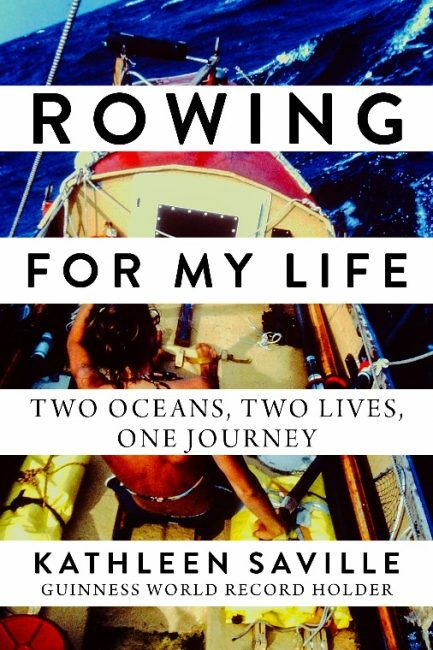 Kathleen Saville‘s (Creative Nonfiction, W’13) memoir Rowing for My Life: Two Oceans, Two Lives, One Journey has recently been published by Arcade Publishing, an imprint of Skyhorse Publishing; read about it here. She teaches creative writing at the American University in Cairo, Egypt. 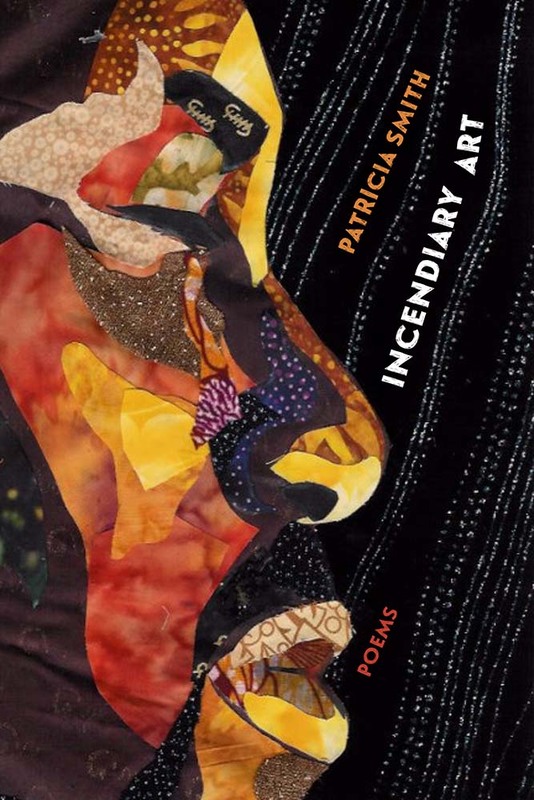 Patricia Smith‘s (Poetry, S’08) 8th book of poetry, Incendiary Art, will be released on February 17 from Northwestern University Press. Her last two books were Gotta Go, Gotta Flow (City Files Press, 2015), a collaboration with award-winning Chicago photographer Michael Abramson, and Shoulda Been Jimi Savannah, winner of the Lenore Marshall Poetry Prize for the best U.S. poetry book of 2012. Patricia has also been chosen as a 2018 Civitella Rainieri fellow—this summer, she will be in residence for six weeks in a 15th-century castle in rural Umbria, Italy. Bonnie Jo Stufflebeam‘s (Popular Fiction, S’13) short story “The Maneaters” appears in the January issue of Black Static. This was the first story Bonnie brought to Stonecoast workshop. On Friday, February 3, 2017, Jeanne Marie Beaumont (Poetry) will be visiting Syracuse to read in the Visiting Author Reading Series at the Downtown Writers Center at the YMCA, 340 Montgomery St., Syracuse, NY. The reading starts at 7:00 p.m. and is free. Later in the month, Jeanne Marie will be traveling to the AWP Conference in Washington, DC. If you are there, please stop by the CavanKerry Press Bookfair booth #330 on Friday, February 10th from 11:00-11:30 a.m., where she will be signing copies of Letters from Limbo. Aaron Hamburger‘s (Creative Nonfiction, Fiction, Popular Fiction) flash fiction “The House Husband” was a runner-up for DC’s City Paper‘s fiction issue. It’s his first foray into Washington, DC-themed fiction, and given the current political situation, he’s expecting to write quite a bit more! 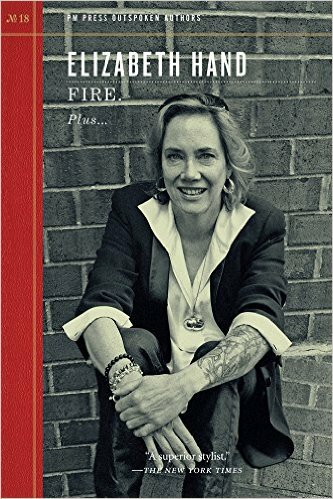 Fire, a collection of interviews, essays, and short fiction by Elizabeth Hand (Fiction, Popular Fiction), has just been published by PM Press. In January, she was the subject of a profile at Literary Hub by Adrian Van Young, and her 2014 Salon essay on the Affordable Care Act was picked up by the Dept. of Health and Human Services as part of the effort to encourage people to enroll in the ACA. Recent reviews include Simon Reynolds’ Shock and Awe: Glam Rock and Its Legacy and Al Ridenour’s Krampus and the Old, Dark Christmas for The Los Angeles Times, and Anne Rice’s Prince Lestat and the Realms of Atlantis for The Washington Post. Elizabeth Searle (Fiction, Popular Fiction, Scriptwriting) hopes to see fellow Stonecoasters at AWP February 8-11 in DC! She has had two events accepted at AWP 2017: she will read in the event “Written on a (Woman’s) Body: A Cross Genre Reading of Bold Writings about Women and Their Bodies”—which also features Dolen Perkins-Valdez—and Elizabeth will moderate “Adaptation in Three Acts: Adventures in Adapting Material for Scripts” (featuring Suzanne Strempek Shea as well as Danny Eaton and David Shields). Elizabeth will also give a brief reading at a New Rivers Press/Fairfield University party at Mandu restaurant February 9th at 6:00 p.m. Back home in Boston, on March 3rd at 7:00 p.m., Elizabeth will read from her novel We Got Him at the Dire Reading Series in Cambridge, MA, at The Out of the Blue Gallery. At 7:00 p.m. on March 24th, Elizabeth will read at Falmouth Public Library on Cape Cod. Finally, check out this new piece on Elizabeth and We Got Him by bestselling author Caroline Leavitt. 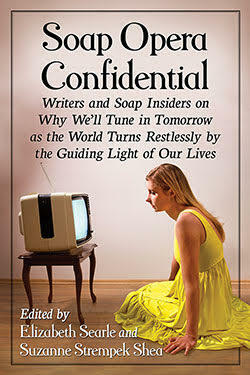 Elizabeth Searle and Suzanne Strempek Shea (Creative Nonfiction, Fiction) soon will be reading proofs of Soap Opera Confidential: Writers and Soap Insiders on Why We’ll Tune in Tomorrow as the World Turns Restlessly to the Guiding Light of Our Lives (McFarland). The life-long soap fans are delighted to have so many Stonecoast voices—current and past—in this collection of essays. In order of appearance in the book, past and present contributors from our community include Aaron Hamburger, Brenda Sparks Prescott, Ann Hood, Lesléa Newman, Shara McCallum, Nancy Holder, Ted Deppe, Marie Hannan-Mandel, Tigh Rickman, Erin Roberts, Susan Lilley, and Jamie Cat Callan. Stay tuned for the exact publication date and a schedule of readings… Suzanne is looking forward to being on two panels at AWP in DC this month, and thanks the hosts for including her. On Thursday, February 9, find her on Washington Convention Center Level 2, Room 209 ABC, from 10:30-11:45 a.m. as a panelist on Elizabeth Searle’s “Adaptation in Three Acts: Adventures in Adapting Material for Scripts.” Other panelists will include Danny Eaton, who wrote the one-woman play Mags: A Conversation With an Audience, based on Suzanne’s book This Is Paradise: An Irish Mother’s Grief, an African Village’s Plight and the Medical Clinic That Brought Fresh Hope to Both (PFP). From 4:30 to 5:45 p.m., find her again on Level Two, this time in Room 203 AB, for Helen Peppe’s panel “Juggling from Within: The Art of Voice,” also featuring Sue William Silverman, Alice Cohen, and Melanie Brooks. Speaking of Melanie Brooks, Suzanne is looking forward to the launch of Melanie’s first book, Writing Hard Stories (Beacon), at AWP, and also to introducing her when Melanie reads from her book Wed., February 15, at 7:00 p.m. at Broadside Bookshop, 247 Main St., Northampton, MA. Any Stonecoasters in the Western New England area are invited to meet up at the Broadside and cheer Melanie on as she begins to get this vital title into the world.